Chances are you were once a freelancer, are currently a freelancer, or have worked with one. They are often vital to our content creation. Yet, marketers still face several challenges with collaborating with them. If you do both well, you will likely be rewarded with quality work. 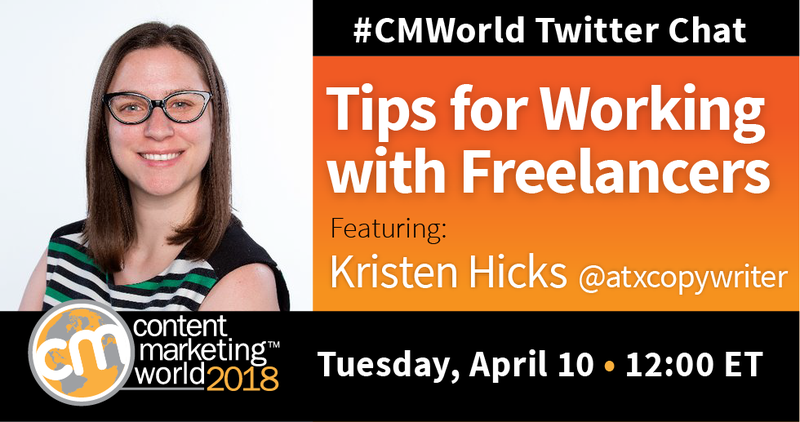 To help us get the results we want from freelancers, we invited copywriter and content marketer Kristen Hicks to join our weekly #CMWorld Twitter chat. What follows are highlights from our discussion. What advantages are there to hiring a freelancer over using an agency or someone in-house? What are some tips for managing freelancers? Are there tools that can help in collaboration? A6: Stay in touch with them regularly because communication is incredibly important for team members. We gained such great insights from both Kristen and our community! Want to see more tweets from this chat? Check out our Twitter Moment. Want to weigh in on the conversation? Add your thoughts to discussion on our LinkedIn Group page. Help your content marketing team improve their skills and stay on top of the latest trends. Attend Content Marketing World in Cleveland, Ohio, September 4-7. Code SM100 saves you $100 at checkout.